Johannesburg - Bafana Bafana face Cape Verde in the opening game of the 2013 Africa Cup of Nations at the National Stadium on Saturday and goalkeeper Itumeleng Khune admits that playing for the national team always comes with some added pressure. According to the soccerladuma.co.za website, the Kaizer Chiefs shot-stopper is looking forward to the opening game in Soweto and is confident that the side’s experience from the opening game of the 2010 FIFA Soccer World Cup against Mexico, will be an advantage for them. Khune said that their World Cup experience will be vital for them in the AFCON, playing as the host nation. “We played against Mexico in the World Cup opening game and managed a draw. This time we are playing Cape Verde and we want a win. We know there will always be pressure, win or lose, but with the support from the whole nation we know we can do it. “We want to score goals and win. We have been playing well defensively that's why we lose with small margins of 1-0. 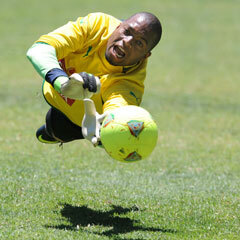 We also attack well, but the opposition know that, hence their strong defences when they play against us,” said Khune. He went on to say that coach Gordon Igesund and the technical team have been working on the team’s finishing. “The coach has been working on finishing with the team since he took over and we just need to polish up, and score goals from the chances we create. We call upon everyone to support the team from Saturday until the end of the tournament,” the Amakhosi man concluded.